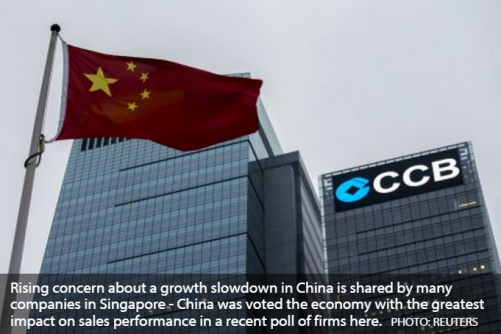 RISING concern about a growth slowdown in China is shared by many companies in Singapore - China was voted the economy with the greatest impact on sales performance in a recent poll of firms here. The quarterly Business Times-UniSIM Business Climate Survey also found that Indonesia has overtaken Malaysia's economy, in terms of how much companies expect these economies' growth to affect their own sales in 2015. Of the 144 firms that responded, 27 per cent expect China to have the greatest impact on their sales this year. This keeps China in the top spot - which it has held for the past three years that the survey has asked this question. Indonesia was the second most cited economy, garnering 16 per cent of companies' votes. It was also most cited by small firms and firms engaged in financial and business services. In third place was the US, cited by 13 per cent of firms. The proportion of companies most dependent on the US economy's performance has remained little changed over the years, the report said. But foreign firms based here, and firms in manufacturing and transport and communications, are now less dependent on the US. Malaysia, which was the second most frequently named for its impact a year ago, fell out of the top three in the latest survey. "That Malaysia is less cited as the most impactful country reflects a reduced dependence of companies on a traditional market and the continued diversification into new markets," said Chan Cheong Chiam, co-author of the report. But sector-specific factors matter too. Malaysia remains the third most important economy for manufacturing firms, and for transportation and communication firms, economic growth in India and Singapore are as important as that in Indonesia. Mr Chan thinks this might reflect the Singapore government's decision to lead the construction of a new capital city in India's Andhra Pradesh state. Other economies cited by companies polled as having the most significant impact on sales include Australia, Vietnam, Thailand, Japan, New Zealand, Germany and the Philippines.